We all have dreams. We all want to tick the next thing off our bucket lists. Maybe we want to run a marathon, earn a degree or be a musician. It’s not hard to imagine all of that in our heads. In reality, it’s usually hard to get there. Winding path, taking us to places beyond our dreams | Weekly Photo Challenge: Zigzag. One of my dreams is to write and publish a book about what it means to be Asian Australian, what it means to be different in the cultural sense and how I’ve come to be okay with this. But writing a book and getting it on bookshelves doesn’t happen overnight. Dreams don’t happen overnight. It takes time for things to happen. We have to be uncomfortable, be willing to learn if we want to make our dreams come true. Sometimes we don’t have everything it takes to reach our dreams. Yet. Most of my study days were spent memorising maths formulas like the typical Asian nerd, always struggling to string a proper sentence together. Then earlier this year I decided to write around 500 words each day on any topic that comes to mind and now, weaving words into stories comes easier to me. So we need to be dedicated. We need to set aside time to do what it takes to achieve our dreams. If we don’t, we’re no step closer to doing so. We need to be patient, brave and prepared to try again on the road to our dreams. Not everything on this path will go right; there will be setbacks and challenges. Hearing editors say, “No, that’s not what we’re after. Make your Asian article more general and relevant to non-Asian readers”, about articles I sent to them wasn’t encouraging. So I decided to blog to share my writing, to be a better writer. We have to be confident. We have to believe in ourselves, believe that we can make our dreams come true. For as long as I can remember, I doubted that I could be a writer because others around me didn’t take me seriously: colleagues thought writing was “my hobby”; my Chinese-Malaysian parents encouraged me to get hired in big, corporate companies. Then I started listening to myself. And sometimes we have to surround ourselves with the dreamers and the believers, those who’ll egg us on when we’re down, to keep believing. Then again, sometimes dreams will just be dreams. For example, if we’re ninety years old, it might be a bit too late to reach our goal of climbing to the top of Mount Everest. We can’t make our dream of traveling the world come true if all of our money goes towards supporting our family. Some things are beyond our control. So then, life goes on. And in a sense that means there is more to life than making our dreams a reality. Maybe it’s being content with what we have. Or appreciating the in-between, the small moments and the people we meet along on the journey to our dreams. One night last year, I dreamt two guys came up to me in the city and recognised me as “that writer”. A few weeks ago, my blog was featured in a national print and online magazine and reached 200,000 views. Sure, I felt excited when I saw the milestones approach, but when I actually held the hardcopy and saw the views, I didn’t jump for joy. Didn’t feel ecstatic. What tops these moments is…talking to you. Every comment I read and respond to, I realise I inspire others to be themselves. Because when you read what I write on this blog, you’re inspired to share an honest bit of who you are right here. It’s very humbling, and I’m reminded it’s okay to be me. Maybe with bit of luck I’ll get a book out there someday. With more luck, maybe I’ll make a living out of what I love doing. I just have to keep hoping. With hope, anything’s possible. Almost. What’s your biggest dream? Have any of your dreams come true? This entry was posted in Asian, Asian Australian, Lifestyle, Writing and tagged Asian, confidence, dreams, happiness, lifestyle, Photography, publishing, self-help, self-motivation, writing by Mabel Kwong. Bookmark the permalink. Congrats to you on being featured! 200,000 views is astounding! Dreams evolve over time but I am a firm believer in giving it everything if the dream is truly something one is passionate about . Thanks, Sue. You always say the kind and encouraging words. Never saw 200,000 coming at all last year. You are right that dreams evolve. One year ago I wanted to do a PhD. A few moments ago, I was planning out the chapters for my book. Funny how things change and we do things we never thought we’d do in our wildest dreams. I “gave up” on blogging after maintaining a diary-like blog in high school for a few months. Today, such a different story and dream. My biggest dream is to travel the world. My goal is to explore the 7 continents before I reach the age of 50. I started with Asia then crossed Middle East, Europe, Australia and North America. I’m in my early 30’s. With prayers, handwork and positivity, my family will be heading to South America next week 🙂 Africa and Antarctica will be next. I’m not sure when. I don’t get disappointed easily. The world is so beautiful. One step at a time then we’re closer to our hopes and dreams. Wow, visiting and exploring all the continents. Very ambitious but it sounds like a very fun adventure. And with all the traveling you’ve done so far, you’re well on your way to reaching this dream 🙂 Yes, hard work and taking things one step at a time is always the way to go to make our dreams come true. Planning is a must too, though we also need to remind ourselves that sometimes things won’t work out and we just need to re-plan. I am sure your husband and kid are there to share the fun times with you, offering words of wisdom along the way to your dreams. Thanks, Kai, for the well wishes and the support. I really appreciate it! It’s all about setting your dream as your goal, visualize it, write it down and get focused on it. Believe in your self, work hard for it and as long as the goal is realistic and achievable you will achieve it. It’s even much easier if your goal is your hobby. With hard work is also coming luck. The luck to find the right editor or whatever. Laying back and waiting for the luck and then be prepared to work hard is most likely a miss. You can achieve everything, yes everything as long as it is realistic and you are focused on it and you really want it. The way to get there is often zigzag and goes up and down. Straighter you go this zigzag line, faster you will be there. 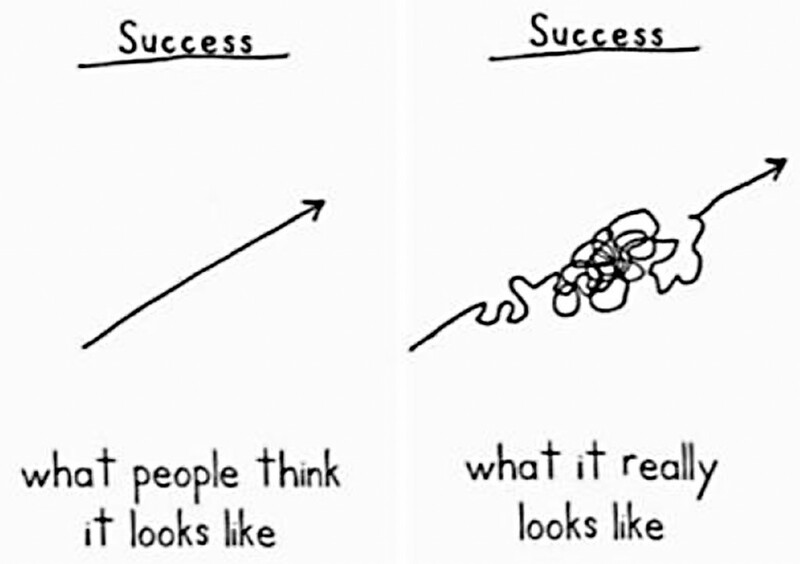 Less lost you get on a zig or zag of your journey, more certain you arrive at the goal. I wish you all the best and big congratulations on your blogging achievements. You are great, I’m sure you will publish your first book soon. PS: I realized almost all of my goals, but sometimes on a zig or a zag I went an other way, set a new goal and refocused on it. Thanks for your encouragement. Haha, don’t know if I’m “great” a I’m just another person 🙂 Good to hear you’ve almost reached all of your goals. You sound like a go-getter. 🙂 I like your drawings for success. 😀 I would not say I’m go-getter, more a hard worker. 🙂 and what I’m doing I try do it to my best. It’s good that you are a hard worker, sounds like you’re always creating opportunities for yourself. Maybe with a bit of luck 🙂 I try my best to be a hard worker but quite a few times laziness takes over 😀 I must keep reminding myself that gets in the way of dreams. That’s amazing that you were featured! Congrats! 🙂 What an achievement! We believe dreams can come true but it does take effort, time and dedication. What you rightfully outlined; It takes ourselves to help make it happen! We can’t sit there and wish something then hope it would just materialize. Our biggest dream is to be able to remain healthy even as we age, so that we can enjoy what the future and the world has to offer! Thanks, monkeys. I only had one week to write the article about my blog for the magazine. I’m glad the editors liked it and chucked it in 🙂 If we sit and wait for things to happen, we just miss all the opportunities that pass us by. And we miss all the shots we don’t take. Time, discipline, willingness and sometimes money are the ingredients to make dreams come true. I had a dream to become an author and I did it three times. Now, I am in the midst of writing the fourth book for next year. Congratulations on being features. That’s an impressive step! You are such an inspiration, Valentina. Becoming an author three times – and in print too! Now that’s something I have to learn. I guess once you get going on your dreams, you just can’t stop and you have bigger dreams in your head. I hope you get your fourth book out there soon and let me know. I want to congratulate you 🙂 Thanks for the nice words as well. You are right, Mabel, I am that person, once I realize one goal I want to realize the next one and the next one again. It takes discipline and persistence and everyone can do it. Thanks for stopping by. Having lots of goals and dreams isn’t necessarily a bad thing. Keeps us occupied and productive. On the other hand, sometimes chasing so many dreams…we might feel empty, a sense of unfulfillment as the dream might not be what we thought it was supposed to be. But I am sure that for many of us, the dreams that we go after mean something to us and we don’t mind the end result. Or else, why do we chase dreams? Exactly, Mabel. I also think not having any dreams or goals with be terribly dull. Oh yes. I can’t bear to dream of a life sitting around. Well, I do like to sit around when I’m tired but other than that, I like to get up and make things happen. That’s the only way to live, to make things happen. Happy weekend. Ooooo, Mabel, Mabel, when are we going to be able to sit down and have a cup of coffee? My family does not support the fact that I live in Thailand or that I want to be a writer. For my mom, it comes from simply not understanding what it means to write, not being able to read anything her daughter writes and the old school belief that what’s important is a “good job”. Ooooo, ooooo, Lani. Lani. We need to catch up in person sometime over a drink. I’ll buy you coffee, you just need to get me water from the tap and we’re good to go for a long, long chat 😉 Sorry to hear that you family aren’t too supportive of where your live and your writing adventures. What traditional, security-oriented Asian parents don’t know and haven’t tried, will scare them. On a similar note, my parents have never encouraged me to write but always reminded me to do “what pays handsomely”. They were very critical when I decided to do an arts degree…I ended up doing some maths subjects alongside the arty ones. Never did too well in the artsy ones until the last semester. Maybe I made the right decision keeping quiet about freelance writing and the blog for about two years now. I agree. I feel bolder and stronger through the “hard-knocks of writing” and making connections is really what it’s about, isn’t it? Definitely. Networking and making connections can open up many doors for you. You never know when you need a friend. I admire your dedication to making your dream of being a writer come true. Even if you don’t ever do the book, what you’ve achieved with your blog is already enormously valuable. And perhaps in a way more valuable, because of the conversations you can be part of this way. Thanks for the nice words, Mameej. I like you mention I might never do the book. It has always crossed my mind that I may not put out a book. For instance, I might have a manuscript all ready to go but there might be publishing problems in the way. I’ve already achieved what I wanted with this blog (sharing stories and inspiring others about culture), and it’s very heartening to have other achievements too – like meeting you and connecting with a fellow Aussie blogger 🙂 Whether my book comes to life or not, I’ve won in so many ways already. It’s August already. I hope you get to visit the Cadbury Chocolate Factory soon. Haha thank you 😀 I’m going to Birmingham this week so expect the post soon!! wow, 200,000 PV is amazing, this is a dreams comes true 🙂 . Yes, I am not kidding on the page views. Always honest. Glad to have connected with you, Bambang. Or should I say Nono… Your blog isn’t shanty at all. You have a great Indonesian following, wow 🙂 Another of my dreams is to connect with more Australian bloggers. I need to work for that to make that come true. I’ve been here for just two years, and I still need to improve all my contents. I am still searching my own identity and what I should share more. If I have much time, I’ll do more blogwalking…but for this moment, I just see and like if the posting impress me. I hope so…but my English needs to be developed hehehehe..
Two years is quite a long while, wow. Much longer than me and your English is great. I understand everything you’ve written in English from what I’ve read so far. “Blogwalking” 😀 That is always fun, I like to do it a lot. Hope you reach your dream of searching your identity and who you are. Good luck. Thank you so much Mabel. Let me try to do blogwalking more often than now. Hehehehe..
As it is fun and I find many new things there. I was wondering where you were for the last couple of weeks but apparently I think you must be busy with the big milestone, featured on online magazine. Congratulations, one step closer to your dream of writing and publishing your book. I mentioned to you about a post which I was going to write specially for you sometime after my holiday and here is the story. Ah, that’s interesting to hear I resemble your daughter. I am a kiddie, after all 😉 And some say Asians look the same…maybe we all do, after all. It’s good to have dreams, because it gives people hope and something to look forward to. Some people develop depression, become disorientated or do silly things is because they don’t have a goal. We need goals to keep us going. Sometimes it takes us a while to achieve our goals because we all go through different adventures, experiences and events that sometimes we can’t control. But if we persist and try our best, we won’t have regrets. The worst thing is sitting there and not trying anything to persue your dreams – now that’s a big regret! You are right. Dreams can give us purpose in life, especially if our dreams involve somebody else – like caring for the disabled or building a nest for a family. As we all have different adventures and experiences, we have different dreams and we will achieve them differently in our own time. Sometimes I don’t understand why we compare our dreams to others, especially our dreams of travel or climbing the corporate, and we end up trying to outdo each other. It’s silly. Oh yes, sitting there and letting opportunities go by isn’t very productive. After all, we miss all the shots we don’t take. And if no opportunities come by, why not wake up, get out of bed and make your own opportunities. Haha, I’m kidding. Mabel, you provide really good content and so you rightfully deserve the attention you’ve received. I sincerely hope that you are able to publish that book! Do you have a specific deadline in mind? Like by 2020, for instance? In case you’re interested, you should check out Michael Hyatt’s blog and read some of the advice he offers to writers (http://michaelhyatt.com/advice-to-first-time-authors.html). There’s some really good stuff there. Yeah, Chris. Only 200,000 😉 Love your sense of humour. I am hoping to publish a book at least via e-channels or e-publishing…but I really do want to get something out in print. I have virtually no idea about the publishing industry, and that will take time to learn. I am hoping to get a re-worked, close-to-completion manuscript done a year from now. Today I started planning the chapters, maybe it will be sooner. Or I can only dream. Thanks for sharing that blog. I’ve read that page you shared and bookmarked it. Hope to read more of it soon. Thanks for supporting, Chris. You’re a champ and I like your writing too. Hey, if you ever wanted to release a preview of your book (like a final draft or the first couple chapters), I would be more than willing to read and review it on my blog! I know it’s not much since I’m still fairly new to the blogging community, but I would still love to do it if it would help you out. Also, have you ever considered starting up an account with Patreon.com? It’s a website for helping content creators earn a little bit for their efforts. I know it’s largely used by the YouTube community, but I also know it can extend to bloggers, artists, etc. Oh, by the way, one of my dreams would be to publish also. Most likely about my life in China. Blogging for me is a way to help capture/record the things I see, experience, and learn while living here. Thanks, Chris. You’re very kind 🙂 I will definitely keep your offer in mind. I do plan on asking people to proof-read and preview my book when the time comes. I am very excited about writing the book, I hope it goes well. Scary, but exciting. I’ve heard of Patreon, and similar sites like Indiegogo and Kickstarter. That is a very good idea. Could be a way to fund print copies of my book if I go the independent route of publishing. I don’t exactly have a huge audience or much of a following on social media so it might not work out. And…I would feel weird receiving donations from strangers. But still, something to think about. Oh my, Mabel! What can I possibly say in a comment box about a subject that takes a week’s visiting in cafés, and that’s for starters! Finish your book, and you will have written a book. Publishing a book is a separate task, not completely under your control. That’s one thing. Of all the forms of writing I’ve done, blogging is far and away the most fun, and you’re already there. I hope with all the work and brainstorming, etc etc, that you’re having fun. That’s another thing. I’ve had two books published over the years by major publishers. You know what? The world did NOT end in a glorious explosion of trumpets. It was really nice, yes, but — not a life, world, or game changer. Now at 80 I’m trying my hand at a third — why not? So you have LOTS of time. My life has only proceeded that way. A better description might be the coiling of a spring, going round and round to get finally to something I might not even have known at the time was my goal. I always envied people who saw far, saw their goal, proceeded to go straight toward it,, and then got there. I thought — sometimes still think — that’s the only way to truly accomplish great things. But you know what? You don’t really have a choice about that either, that is, your modus operandi of unfolding. Some of us are winders and meanderers, and that’s that. You may be one of us, you may not. It’s not only your looks that you are youthful, you see. By my lights all of you is very, very young, and I am astonished and delighted by how much wisdom you have already accumulated. Gambatte! You are so, so, so right. Writing a book is one thing. Publishing a book is something else altogether – dealing with copyright, defamation laws, design…. And these days there’s print and e-publishing, so many publishing platforms we have on our hands. Congratulations on getting published two books by major publishers. It must have been a long road to get your stories out there on the shelves, and looking back I assume you’d learnt a lot along the way, memorable lessons and maybe not-so-memorable ones. Good luck with the third, I know it will be out there soon. I guess the most exciting part about achieving a dream is…living it. Enjoying the moment. Once you’ve reached your dream, stand on a street and look around – you’ll see other people and maybe you’ll feel insignificant as you’re just another person. That’s how I felt when I found out my recent article got published. Thanks so much for the kind words, I really appreciate it. And thanks for stopping by. 200,000 views, how amazing! Congratulation, Mabel! Thank you for sharing it with us. So glad you posted your achievement, Mabel. Through your eloquent writing, we are sharing your excitement. I love to know your journey of pursuing your dream. Thanks, Amy. “We are sharing your excitement.” You captured my sentiments perfectly. I hope everyone is enjoying the ride so far and what they read on this blog. Been mixing around topics a lot this year, and I think people seem to connect with them and I’ve seen my writing going in new directions. All dreams are different, but this is good advice for the dream of writing. It is quite the slow-paced dream, like academia but without the clarity of a step-by-step process with credits and such. One can spend years working on something and not even know if it’s the right direction. Still, to sincerely work on a dream, one must keep working. Congratulations on all your progress. Sounds like you have made an awesome step by being in print. But, I know what you mean about not jumping for joy just yet. Interesting that you mentioned the academia dream. Exactly a year ago I was absolutely intent on doing a PhD and writing a book never even crossed my mind. One year on today, things can’t be more different and my book is already taking shape, faster than I expected. I think you’re right – we don’t usually have one single dream or grand thing we want to do. But the more we chase, maybe the more unsatisfied we become. Sometimes I think maybe we should live life with no expectations and just do what we love in the spur of the moment. Thanks for the well wishes. And well done on getting your work out there, quite a few e-books out and I’m sure more to come. My dream for now is only to create a stable environment for my little family and after that enjoy life more by traveling to new exciting places. I try to start with simple dreams as my old dreams during my teenage years were shattered due to injuries resulting in not being able to follow my sport anymore. Sounds like you are taking your dreams one step at a time. Apartment already set up, good on you. Sorry to hear that you aren’t able to pursue your sport anymore, I’m guessing it’s swimming. You could always take up another sport…maybe table tennis or badminton. I really doubt that my book would come out before yours, I seem to lack determination to sit down And write when I have actually some time. I have read over the years so many books, gathered in so many different writing styles that I should have a clue what to do but as soon as I read my work it feels so “lacking” something. It is good that you read widely and as you said, are familiar with different writing styles. I haven’t been reading a lot these past couple of years due to study and work, and I’m expecting some hiccups when it comes to writing my book. Then again, I do read a lot of blogs and news articles for research, I suppose that counts. Me too. It baffles me how some writers can put out a near-perfect piece of writing after just one draft. I already read my blog post 10 times before posting, I really fear the editing process of my book. Thanks Mabel! How have you been? Not too bad. Living my dream of being a writer for most of this month. If we want dreams to come true, we have to make time for them. I hope you are well! Hello, Imelda. Always nice to see your gravatar pop up here, thanks for reading and visiting. Thanks for the nice words and encouragement. My dreams are coming true now…. that is an interesting thought. Maybe we’re all on the road to our dreams in some way and we don’t realise it. Thanks for the nice words, Sandy. That is interesting you mention I have a “social media platform” – I would like to think so on WordPress but on Facebook and Twitter, maybe not yet but getting there. I have thought about connecting with local writing classes and forums online of late, thanks for the heads up. Hopefully I will be able to squeeze that in before the year is out 🙂 Wise words you have there, Sandy. Dreams can come true. Good luck with the book – maybe you’ve just gone to the wrong publishers? I don’t know if I’ve gone to the wrong publishers – they’ve always been local print magazines, and an online one. It’s always discouraging to follow their suggestion and pointers to re-draft only to get the articles knocked back at the last stage. Every publication and publisher has their own voice, it’s hard to follow that a lot of the time in my articles. I love this post! 🙂 I have so many dreams: getting my master degree, setting up own business, get married and have kids, travel all around the world etc. 🙂 And I’m definitely gonna work hard to make all of these dreams to come true!!! Funny how I got all emotional when I reached that part where you said, “We can’t make our dream of traveling the world come true if all of our money goes towards supporting our family. Some things are beyond our control.” That speaks a lot about the big dream: setting foot on the world’s oldest tropical rainforest, Taman Negara. At this point, I don’t actually think it’s gonna happen anytime soon. Howbeit, I’m hoping. You’re right, that spark of hope should not die. I have it and I will have it. Promise! Being able to land to another country was actually a wild dream back in the day. I never really entertained the idea of going abroad. The universe, however, has a hard-to-comprehend way of meddling with us so that I got here in in Saudi Arabia. I used to regret that but looking at it now, makes me so grateful. I’m sure you know why. I learned to cling on the advantages I can get from being here and, at the same time, embrace the disadvantages. You know what I mean. I could sense that you love Math as much as you love English. This is something rare for exceptional writers like you. I hope one day you’ll be able to trek through Taman Negara, Sony. I’ve never been there too, it’s one of the places I would like to visit. Traveling is always a fun experience where you get to see so many things and meet so many people and learn…but sometimes it’s a bit of a high-achieving dream: you need the finances for it and you have to be physically and mentally fit too. “The universe, however, has a hard-to-comprehend way of meddling with us”. You are so right, and there’s so much hope in that sentence. We are quite similar in that I used to detest moving back to Melbourne a lot but these days it’s a different story. You are so right again. I really did like maths (applied mathematics, calculus, integration, the engineering kind of maths) in school and even majored in at university. But…I don’t love it as much as English and somehow writing connects with my heart that maths never can. Thanks for your nice words. Ohh Mabel, you and your beautiful and inspiring texts! They always make me think of my life…and this post specifically made me think of dreams I did not accomplish, but that its never too late nor impossible, even though the world can really be mean to us! I really hope and believe that you will accomplish your dreams, you are a very inspiring person and writer, dont give up, thats the most important thing! I would love very much to read a book of yours! Your texts comfort me and Im sure it does other people too. You deserve to accomplish your dream and get recognized around the world. Your blog is already there, its a big step! I wish you all the best and I want you to know that I support you 😀 you rock! Ohh Thank you Mabel, Im happy to inspire you somehow! You are on the right way 😀 and yes, it takes time… I already tried writing a book, but I guess I need another topic I am more passionate about! 🙂 keep going! hahah mine will take a WHILE… may not even happen. But lets see… you never know 😀 thank you!! I could already sense your book around the shelf (as opposed to the corner). I hope you had a good week, and have a good weekend. 🙂 The weekend was great, although I just found out Monday that all three of my grandkids have high fevers, one with 105° F. No one’s called back yet, so I don’t know what’s happened, but it doesn’t sound good, what, with no return call because they always call right back. Oh dear, I hope your grand kids get well soon. Not nice at all to be sick. I hope your family do get in touch with you soon, they must be very occupied taking care of the kids. Take it easy. The doctor “guesses” they have upper respiratory infections and so is feeding the oldest daughter anti-biotics. I think my dau-in-law said he recommeded switching between Ibuprofen and the other one like it, which name I’ve forgotten but should know, every three hours. I talked to her this morning. Thanks, Dedy! Your old man is so right. We need to get out of bed and run after our dreams and catch it. That’s the spirit! Congratulations, Mabel, on being featured in ‘The Ethnic Broadcaster’. And for inspiring other people. Thank you for the nice words, BB. I could be entirely wrong, but it sounds like you’re familiar with The Ethnic Broadcaster. It’s good that you know how to appreciate what’s right in front of you 🙂 Looks like you live your dream every day, relaxing at home and that is not lame one bit. Sometimes we might reach the next big thing or moment in our lives, only to be left disappointed or unsatisfied and wanting to chase more dreams, bigger dreams. I don’t think luck has much to do with it. It is who you are .. strong, confident, patient. You will get there. Congrats on your journey so far! My favorite on your list would have to be “We need to be patient, brave and prepared to try again on the road to our dreams”. Some people get frustrated when things don’t go the way they like. They blame the world, the people around them, etc. They tend to forget the world doesn’t revolve them so they are so many things…much more than they can imagine that can slow down their “ideal timelines”. Reality is harsh that’s what I starting to see now that I am working and slowly but surely taking steps to fulfill my dreams. One important lesson I learned is we have to recognize the limitations set by our situation and capacity so we do not get jaded when we do achieved something on our desired timelines. I hope you achieve it 🙂 It is definitely not impossible! It must have been an amazing feeling to see your words & work being featured and having such a far-reaching appeal and audience…and interesting that you say you did not feel much when you picked up the hardcopy. I think it is because you are already moving onto your next thought/idea/dream and that is pretty cool, as you say “We need to set aside time to do what it takes to achieve our dreams” and you seem to be always moving forward with such thoughts (at least from what I see in your blog). It feels like I’m chasing and chasing something, chasing to no end. But I am enjoying what I’m doing in the present and I guess that is most important. Great post Mabel and thanks for your inspiring thoughts. I wish you heaps of luck that your dream of publishing a book will come true one day. I love this post and I wish I can reblog it on my website, please let me share your inspirations with the rest of my audience. Thank you! Feel free to share and reblog, Kally. I am flattered you find my blog interesting. Thank you! This is what it is! My thoughts, your dreams. My Dreams, your thoughts!